Can you tell us a bit about your Croatian background? I was born in Canada from Croatian parents. That makes me Canadian by birth, Croatian by blood and heritage. I was too young to remember when my parents took me back to Croatia. I spent most of my life in Croatia, with occasional visits to Canada, including a year I’ve lived here in 8th grade. When I married Zvonimir, we decided to see what Canada has in store for us, so here we are in Ottawa. Why did you start posting recipes? Are they Croatian related? Zvonimir promoted Croatia through photography. I thought gastronomy promotion would be fun and that kinda gave us common agenda, something we did together. We were already touring remote parts of Croatia for photo shoots. We were also already cooking daily and I’ve taken baking as a hobby, so I added that to the mix. I started with what I knew. I was always interested in history, so I researched every recipe’s history and wrote about it. Add mouthwatering photos and you can hardly go wrong. The internet is a fascinating place and Google+ was a place which connected people around common ideas so I met a lot of them. That lead to live-streamed cooking shows where I made delicacies like apricot dumplings and floating islands. That’s not where it stopped, I’m naturally curious and like to try new things, so I was happy to explore other cuisines, like that time when we co-cooked Roti John live. I hope I’ll never stop exploring! Which is your favourite recipe? The one I’m going to prepare next. I have a thing for making new recipes. Don’t get me wrong, there are things I like to prepare, but none of those compare to a rush of collecting the ingredients and embarking on a journey to a new meal I’ve never done before. I like to stick to the original recipe when making something for the first time. There are certain challenges when doing that, especially when doing so with handwritten recipes from old notepads where pages turned yellow long time ago. Not so long ago, for example, I made this cake. My gut was saying there’s something wrong with the amounts but I went with it anyway, you know, to keep up with the original. It became apparent my gut was right when things started overflowing in the oven. Luckily it was still enough early on to save things and end up with two cakes instead of one. Could have been worse, haha! You’ve taken some of your recipes and produced a cookbook – ‘Beyond the Cake’. What inspired you to do this? It was close to how we describe it on the Beyond The Cake website. I was baking a lot. Most of them were traditional Croatian cakes and sweets. It was borderlining between hobby and obsession, but still enough on the hobby side to stay sane, haha. Zvonimir made photos. I researched and wrote about the history of every cake, the origin story, if you will. People liked the whole thing and I began getting a following. Long story short: we were making a book. But, if I was to do it, it had to be different from what we’ve seen so far. It was not to be a mere cookbook. It was going to have simple enough recipes that even kids can do. In fact, we were going to focus on young parents with kids. So we had to build stories around recipes. We had to tie those stories into a continuous story throughout the book. We wanted kids to learn a thing or two while baking. We wanted parents to have fun too. So we included fun facts and interesting history lessons in every chapter. Since we live in the social media era, people want to share their fun times with their friends. And photos are worth thousands of words. So we included tips and techniques to make people’s photos stand out and make memories. The very same techniques Zvonimir used when making photos for the book. How has the cookbook been received? We can sort all the feedback into two major categories: “I love it!” and “I want more recipes./This is not really a cookbook.” Both of which says to us we did a great job. Our goal was to get young ones more involved in kitchen activities, not to create a list of recipes. We saw people posting pictures of their kids baking, of the cakes and cookies they made and creative changes kids did to the recipes. Some notable examples: Azlin Bloor, Peri Avari, Kim Bultman. That’s exactly what we hoped for and we call it success. 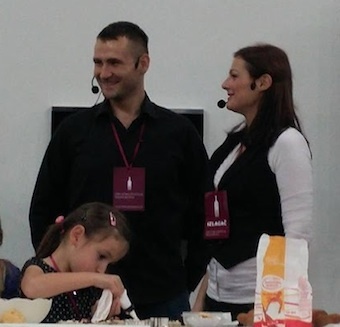 I got invited to host a workshop on Croatian Food and Wine Festival, which we gladly accepted. We got children to volunteer with us on stage and the feedback from them and from the audience was equally positive. Makes me very happy and thankful for being able to be part of it. Jasmina with some of her cakes! Will there be a second volume? I get asked that question a lot. I would very much like to produce another book. In promoting Croatian food and culture in the world we had people from all over the world making characteristic Croatian sweet Easter bread, Pinca, this Easter. This May, we’ll be organizing Croatian cuisine month on Google+ where we will visit every region of Croatia through their characteristic meals. 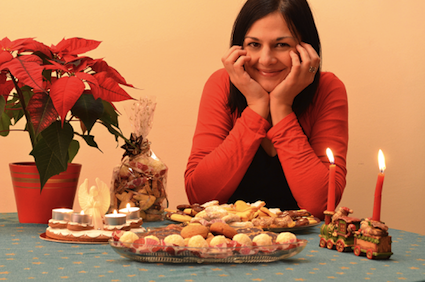 We hope more people will pitch in and test their cooking skills on Croatian delicacies. It’s gonna be a fun and busy month. On top of that, we’re exploring other food-related projects which we can’t discuss at the moment. With all this going on, I don’t yet have any dates for the next book. Visit Jasmina’s Google+ page for recipes and other updates! A fantastic write up, Jasmina Brozović is a fantastic culinary ambassador for Croatian food and culture, as is her husband, Zvonimir.